For Landowner Resources, click HERE. For resources related to the A2A projects, you can check the mapping and reports in the Our Work section. Listed below are other selected papers and published research about A2A. Brown, R. & Harris, G. (2005). Comanagement of wildlife corridors: the case for citizen participation in the Algonquin to Adirondack proposal. Journal of Environmental Management, 74, 97-102. Canadian Parks and Wilderness Society, Ottawa Valley Chapter. (2004). Thousand Islands Ecosystem Community Atlas. Ottawa: CPAWS. Stephenson, B. (2001). The Algonquin to Adirondack Conservation Initiative: a key macro-landscape linkage in eastern North America. In D. Harmon (Ed. ), Crossing Boundaries in Park Management: Proceedings of the 11th Conference on Research and Resource Management in Parks and on Public Lands (303-310). Michigan: The George Wright Society. Quinby, P., Trombulak, S., Lee, T., Lane, J., Henry, M., Long, R., & MacKay, P. (1999). Opportunities for Wildlife Habitat Connectivity Between Algonquin Park, Ontario, and the Adirondack Park, New York. Vermont: The Greater Laurentian Wildlands Project. Keddy, C. (1995). 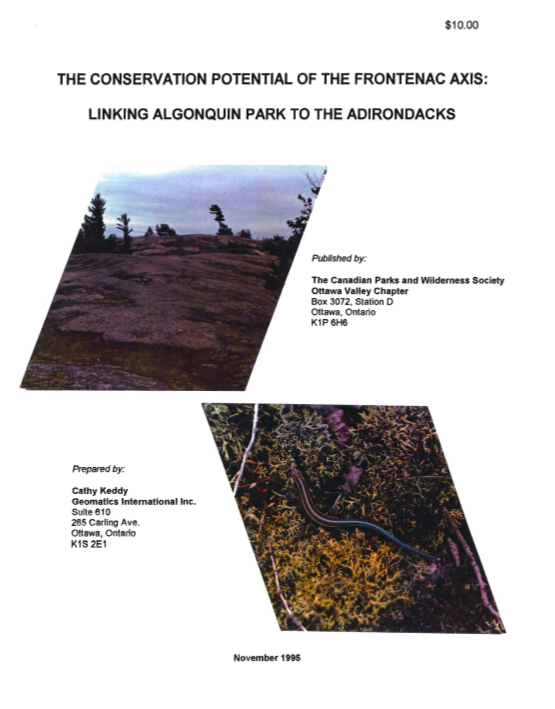 The Conservation Potential of the Frontenac Axis: Linking Algonquin Park to the Adirondacks. Ottawa: Canadian Parks and Wilderness Society, Ottawa Valley Chapter.